Looking for unique, eye-catching home décor inspired by the sea? 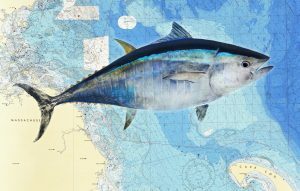 Fish prints are both an elegant and whimsical way to celebrate the water and all it has to offer on the walls of your ocean home. 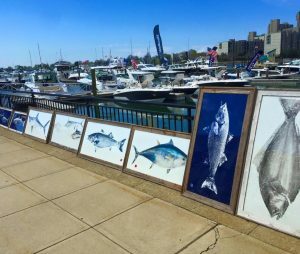 We came across Fished Impressions’ Joe Higgins and his storefront / studio while exploring Salem’s Pickering Wharf. Joe’s prints marry his admiration for the sea with his love for art, and it shines through in his gorgeous works. We wanted to learn more about Joe’s masterpieces and artistic inspiration so we stopped to ask him a few questions. What is the history of fish printing? 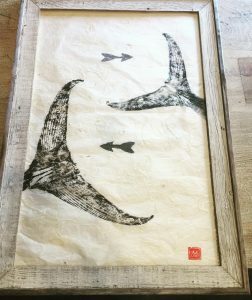 Gyotaku (Japanese, from gyo “fish” + taku “rubbing”) is the traditional Japanese method of printing fish, a practice which dates to the mid-1800s. This form of printing may have been used by fishermen to record their catches, and has become an art form of its own. How did you get started? It’s the spring of 2009 – I’m sitting on a couch admiring an impressionistic painting of a large fish in my friend’s office. It was beautiful with bold strokes of orange, blue, and gold on three large sheets of newsprint. It was amazing that I could see every scale and fin in detail and the caudal fin almost looked like it could “tail slap” the wall. I thought it would be a perfect trophy for a kayak fishing tournament I was running later that summer. I knew the winners would cherish these one of kind works of art. The best part was that it seemed simple to do, at least simple enough for a guy who graduated from a prestigious art school and loved to fish. Next thing I knew, I opened a studio. What started off as an experiment has become an obsession. I love making fish prints. How do you incorporate fish prints into home décor? 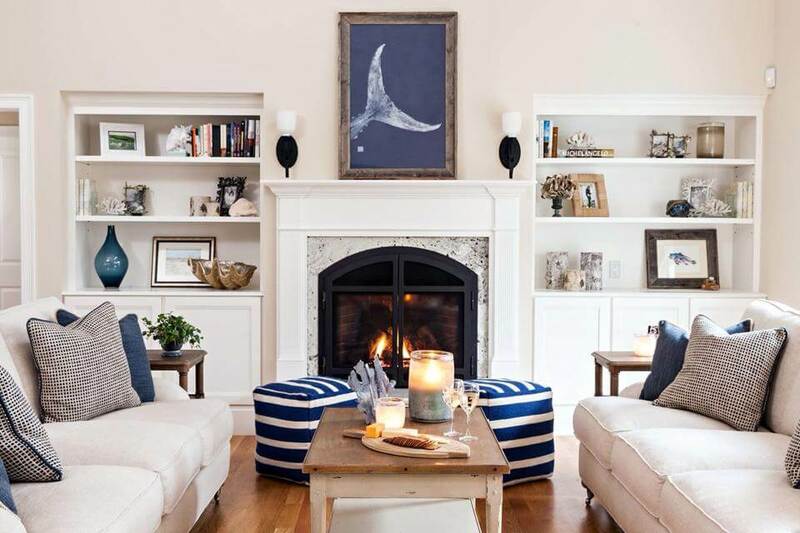 Surprisingly, most people who love fish prints and decorate with them are not fisherman- most live or are inspired by the ocean, or are those from the middle of the country who just like to be reminded of an area they visited or where they grew up. The tuna tail makes a bold statement and most people call it a whale tail. 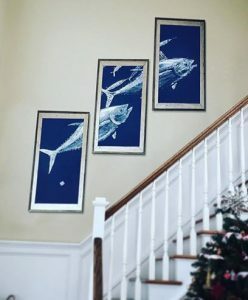 Over the years, I’ve done many mantel pieces and designed spaces with triptychs and diptychs to create the illusion of schooling fish. Fish prints are also great accents to living spaces. A lot of people associate fish prints with a specific memory, or they just like the abstract nature of the art. Many people enjoy the level of detail I’m able to get in the pieces. What materials do you use for color? Majority of my prints are black ink on traditional Japanese papers, namely of the Mulberry plant- some have leaves embedded in the paper or fibers of plants. The paper itself is also work of art— I do not make my own paper yet, but plan to do so soon. One of the first gyotaku artists printed white ink on blue paper, and I started out doing that as well. I think the white on dark blue is very design oriented and reminds many of an old blue print -it’s also a color that works with many types of interior design. Anything unique about the framing? I like everything about the prints to be inspired by the sea. I began making frames out of old wood lobster crates. I consider reclaimed cedar as my go-to frame. Where are you based? You can find my work in many places on the north and south shore and on Cape Cod and Martha’s Vineyard and Nantucket. My main gallery is in Salem on Pickering Wharf- I have a full gallery there and offer classes to learn the art in the winter there. 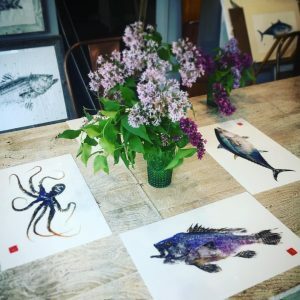 My prints are also in many boutiques including Welch Company in Scituate, Mahi-Mahi Gold in Chatham and Edgartown, Island Outfitters in Osterville and Newport, and Local Colors Gallery in Gloucester.